While it's not extremely rare for such occurrence to happen, you could not help but think about the possibility of lack of maintenance here. The more wind farms you open up, the higher the chances of failure to happen simply due to the number of wind turbines you erect. Even in Japan where nano-precision and high-technology are daily words and the maintenance mentality is respectable, you can hear that the Fukushima nuclear facilities could have been better maintained. 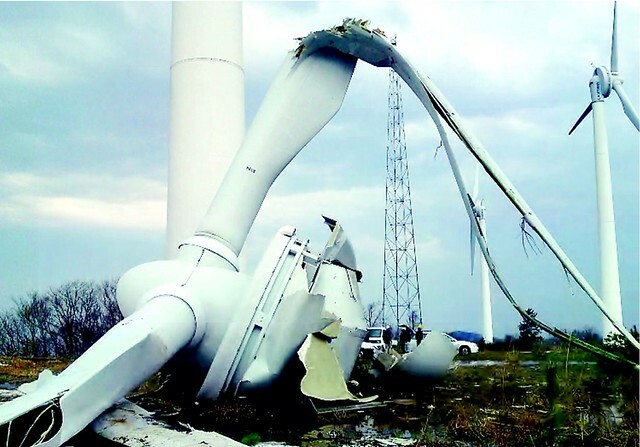 A 38-ton wind turbine crashed 50 meters to the ground in Kyoto Prefecture after the steel column supporting it snapped, according to officials. The massive Dutch-made turbine, which sat atop a Japanese-made steel column, was part of a mountain wind farm. It was put up in 2001 with an expected life of at least 17 years. “We are asking experts to look into the cause of the problem. We suspect metal fatigue might have played a role,” a local government official said Thursday, adding no one was injured. The smashed turbine was discovered Wednesday although it is not known when it fell at the remote facility. A strong windstorm struck wide areas of the nation around that time. Wind farms have sprouted across large stretches of Japan over the last two decades as the resource-poor country seeks to capitalize on its natural bounty. The drive for alternative energy has intensified since the Fukushima nuclear plant disaster started two years ago. Only two of Japan’s 50 nuclear reactors are in operation and public opposition against restarting reactors remains strong. Japanese do believe in Kaizen, or continuous improvement. These were installed in 2001 (12 yrs) with expected life of at least 17 yrs. Don't you think it's too soon to fail?